The black Armour for iPhone 7 Plus from Moshi is a hard-shell, brushed aluminum case designed for anyone looking to add a little style and protection to their iPhone. The solid-color outer shell guards against the scratches and bumps that inevitably occur if you carry your phone around with you. 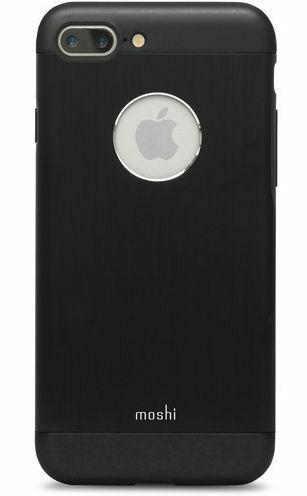 The Armour does this without limiting the iPhone's features and functions. All the buttons and ports remain accessible, and there's a cutout for the camera and flash. The outside surface of the Armour is treated with a special coating that adds to the overall look and feel of the case. The slim design, increased protection and striking looks make the Armour for the iPhone not only an attractive case, but a functional one as well. The Armour includes a microfiber cloth to help clear the dust and dirt away before you apply the rear protective film.